a share of the uneven bars crown Sunday. Her event win marks only the second USAG National title in Brown’s history, after Diana Walters ’16 won the allaround in 2014. Nelson earned a 9.775 on bars to advance from the preliminary sessions but suffered a fall in the finals, finishing with a 9.100 for 12th place. Both Nelson and Costa were recognized as First Team All-Americans on bars. Gardner punched her ticket to the vault final by snagging the top spot in the second preliminary session with a career-high 9.825. She completed her sophomore season with a 9.7375 in finals to earn a fifth-place finish and First Team All-American honors. Green tallied a 9.750 during prelims of vault to collect Second Team recognition for the third time in four years. She then concluded her collegiate career by receiving First Team All-American honors on balance beam, where she finished 14th with a 9.675. Rose Domonoske ’21 gained Second Team recognition on beam after earning a ninth-place finish in prelims. The six All-American laurels acquired at the 2019 USAG National Competition amounted to the most since 2016 when the Bears collected 11 All-American awards. the game,” Kniffin said. “Down the stretch, they just made more plays than we did.” While the Bears’ record is 4-7 this year, the team has only been marginally outscored by opponents by an edge of 139-135. Four of Bruno’s losses have been within two goals or less, and the team has faced three squads ranked in the top 10 nationally: Yale, Penn and the University of Virginia. Going forward, the Bears hope to build off this experience of playing with high-level talent as they continue to push for a berth in May’s Ivy League tournament. “Having great competition in the Ivy League means that everybody is forced to play their best game every time we step on the field,” Kniffin said. students right here on campus, we have undocumented students right here on campus. It’s our obligation to try to protect them as best we can. So I see those issues as being very directly related to Brown’s mission. You’ve said that choosing not to divest is abstaining from the political conversation, but many have argued that it is a political statement in itself. What is your response to that? I think that is not a sound argument. People who say that are saying, ‘I want to force Brown into a yes or no choice here, and if you don’t say yes, then we’re going to say that you’ve said no. Either you’re against Israel or you’re for Israel.’ By choosing not to divest, we are not saying anything about whether we’re for or against Israel. Our obligation is to run the endowment, to have great, long-term, risk-adjusted returns … and in very rare cases to apply moral principles to how we invest. And by not acting on every human rights issue that comes to the attention of the University, that certainly doesn’t mean that we’re condoning behavior. always going to get the answer that they want from the administration. anti-Semitism. … I really appreciate the fact that the students involved in the Brown Divest campaign were very open at saying ‘this is not about anti-Semitism.’ …But, I think we have to confront the reality that anti-Semitism is on the rise in this country and around the world, and a lot of people are feeling very threatened. …The day after I wrote my letter, a large number of Corporation members got an email from somebody — I don’t know who it was, I don’t think it was anybody affiliated with Brown — that was one of the most vile, anti-Semitic emails I’ve ever seen. So, this kind of conversation has to be conducted carefully. … And the same is true on the other side. We have to guard against Islamophobia, too. This interview has been edited for length and clarity. the most important responsibilities of the Corporation, because their duty, ultimately, is to (ensure) the long-run financial security of Brown. Why shouldn’t students, faculty or alumni have a say in how Brown’s money is invested? Because we have a responsibility to get the best risk-adjusted returns possible, and we need professionals doing this. What are the logistical difficulties of divestment? What are the costs? The costs of divestment would depend a lot on the specifics of the situation. In general, we can handle narrowly defined divestment actions where it’s one or two or three companies. … One of the issues that I had with the Brown Divest campaign was that … the list of criteria was very broad. It could have expanded to many companies. And if you look at the companies that are (listed), these are major corporations that are in every index fund and almost any stock portfolio that you could think of. … Like most universities, we do very little direct investing. … Right now, direct holdings are less than five percent of the endowment. We’re not choosing stocks (or) companies to invest in. We’re choosing fund managers, who are making investment decisions. … If we went to those (managers) and we said, ‘we’d love to invest with you, but you have to promise not to invest in the following six major companies, and by the way, we might be adding ten or twelve more names,’ the response would be, ‘we don’t really need your business.’ And we would have a hard time managing the endowment in a way that’s financially responsible. University and its fund managers say that the University can still tell people what it has divested from? Yes, because … we have many fund managers. So, if we say we’re not invested in tobacco, we’re not talking about the positions of any of our individual fund managers. I guess you could infer from that that none of them own tobacco. But that wouldn’t be a violation of the NDA. Is the University currently aware of what companies it is invested in? What sort of system does it have for tracking and monitoring our investments? There is a very sophisticated system in place for tracking and monitoring (the University’s investments). … (The Investment Office’s) job is to keep track of the performance of those investments. …(But) we sign (non-disclosure agreements) with our fund managers. Even if they tell us what they’re investing in, we’re not allowed to tell others. … T﻿hey view that as their intellectual property. This is their business, trying to figure out what to invest in, and they’re not going to give it away for free to the rest of the world. If you were to release the University’s investment portfolio as a whole without specifying which fund manager holds what stock, would that be a violation of the NDA? I think it would be very hard to do that because things change very rapidly. We can divest if we want to, (but) the larger the number of instruments that we need to get out of, the costlier it’s going to be for the University. Also, you worry that you’re going to undermine confidence in the endowment if people think that it’s susceptible to veering away from being something that is managed to promote high returns. Does the University work with — or has it considered working with — funds that offer environmental, social and corporate governance investment options? A lot of fund managers are coming out with ESG, social-choice-type funds, and those get considered and vetted like other funds. I don’t know where we are right now, but sure, that’s something that we’re very much open to. When our investment office is doing due diligence on a fund manager, they ask about their long-run returns and they look at the stability of the leadership team, all the things that you would normally do to assess the expected future returns of investment. … We want to invest in fund managers who have integrity and whose values reflect our values. So it’s not just a purely cut-anddry financial decision. This interview has been edited for length and clarity. Ivy Film Festival industry staff member Joe Suddleson ’22 spoke to MacLachlan about his role in “Giant Little Ones,” his extensive career in Hollywood and his relationship with friend and director David Lynch. bubble of Hollywood,” MacLachlan said, laughing. “I started from the outside, and sort of stayed on the outside, and it was challenging at times, especially when I was younger.” But MacLachlan said he was fortunate to have connected and worked with Lynch on multiple projects. said. “First time through the order, (Murray) got ahead of us in terms of throwing strikes. He just threw well today, … that was kind of the difference in the game.” But Brown battled back, with a two-run double from Delano drawing the team within four. In the eighth inning, designated hitter Phillips launched a two-run home run to left field to cut the deficit to two. Dartmouth’s Ubaldo Lopez hit a monstrous home run in the top of the ninth, but Lomuscio answered with an RBI single. Farris drew a walk for the chance of a winning run with one out, but both Homza and Phillips faltered in their chances to earn Brown the walkoff victory. Bruno fell 7-5, dropping its Ivy League record to 6-6. Lomuscio applauded his team’s resilience despite the failed comeback effort. “It’s easy to quit when you’re down 5-0, but we showed we can come back against anyone,” he said. Even with the series loss, Brown has won four of its last seven games. “We’re starting to hit our stride a little bit,” said Head Coach Grant Achilles. “I like where things sit right now. Obviously we’d like to be in a better situation record-wise in the league, but I think with the next three weekends we’re really positioned well to take care of business on our end.” Next up for Brown is a road series against Columbia, who leads the Ivy League with a 9-3 conference record. The following weekend, the Bears will travel to Princeton to take on the Tigers, who hold a 4-8 record in the Ancient Eight. As the housing lottery comes to a close, students finalize plans for their living situation next year. Unfortunately for those placed in the summer housing lottery, their futures remain uncertain. you willing to put in? See stars on page 1.
protest” without “any drama or negative reactions,” Velazquez said. 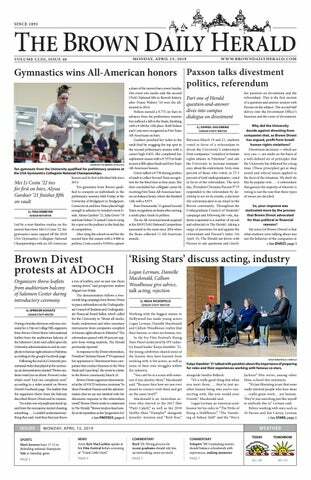 Though she disagrees with the University’s opposition to divestment, prospective student Sarah Uriarte said the University’s stance won’t discourage her from attending Brown. “Even though I disagree with what the University is doing, I don’t think it hinders my decision to attend this college,” she said. But prospective student Katie Bang said the demonstration did not cast a positive light on Brown Divest. “It was kind of disrespectful, I felt, how they interrupted” the ADOCH event, she said. The leaflets thrown down from the auditorium balcony also posed a potential safety hazard, Bang said. “One of my friends, she’s on crutches, and it was kind of slippery to walk around,” she added. Even after reading the leaflets, many prospective students remained confused about the demonstration. “I read the paper, it also didn’t really explain what (Brown Divest) was,” Bang said. The demonstration “was kind of out of the blue since no context was provided for it,” said prospective student Tommy Bellaire. “My opinion is still confused. It was confused before and it’s confused after,” he added. Prospective students were generally uncertain about the purpose of the demonstration. Many thought the demonstration was a prank or part of the welcome ceremony. “We had no clue what (the protesters) said. We all thought it was a joke for a little while,” von Fedak said. The University was not available for comment. friends. So today, I don’t have a point to make so much as a request: Have fun with it. Do the things you’ve been putting off all these years. Cross those items off the bucket list. I went to 14 Mets games — what have you always wanted to do? Now is the perfect time to do it. Today, I don’t have a point to make so much as a request: Have fun with it. Do the things you’ve been putting off all these years. polarization wheel or whatever happens in science classes. I know that I, for one, plan on taking my own advice. Last Thursday night, I finished a statistics assignment. Friday afternoon, I took the train to New York. Saturday and Sunday, I went to two Mets games. It’s not 14, and the 2019 Mets aren’t the 2015 Mets — at least not yet, and not when Jacob deGrom isn’t pitching — but it was worth it nonetheless. I finally got back to Citi Field. I spent time with my family — especially my brother, who is 11 and just starting to like the movies and TV shows I show him, and my dog, who weighs 130 pounds and drools like a fire hose. I’ll remember this weekend. I’ve already forgotten my grade on my first statistics problem set. Find the balance, is what I’m saying. Get your work done, but don’t only get your work done. In these last few weeks at Brown, find time to live. In short, don’t do anything you’ll regret. But if you don’t do anything, you’ll regret that most of all. James Schapiro ’19 can be reached at james_schapiro@ brown.edu. Please send responses to this opinion to letters@browndailyherald.com and op-eds to opinions@browndailyherald.com. In a professional world where connections are king — and it’s not what you know but who you know — is there any room left for objectivity and empiricism in hiring? factors. But the solution to imperfect empirical measures is to make them more perfect and fair, not to abandon them in favor of networking and, generally, some of the least scientific, most subjective practices available. This doesn’t mean aptitude tests should be the only factor, but they deserve a place at the table. The truth is, we’re wasting an enormous amount of time and resources trying to become the most well-connected applicants when we could be spending that time becoming the most qualified. We can’t blame people who network, as it’s in their self-interest to do so. And I for one think that as long as the system is what it is, I want to live in the same world as everyone else (that’s why you’ll, from time to time, see me standing, conflicted, in the middle of a networking event). But I’d much prefer that didn’t matter. It seems hardly necessary to elucidate the virtue of a society where the smartest, hardest-working people have the opportunity to rise from the bottom of the social ladder to the top of the heap. If that’s the goal, we need to start getting more scientific. Andrew Reed ’21 can be reached andrew_reed@brown. edu. 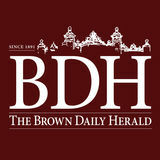 Please send responses to this opinion to letters@browndailyherald.com and op-eds to opinions@browndailyherald.com.